Home Guides Can Oculus Rift with Touch Controllers Run SteamVR HTC Vive Games? Can Oculus Rift with Touch Controllers Run SteamVR HTC Vive Games? If you’ve just got your Oculus Rift with Touch controllers, congratulations! You’ve just joined one big, happy, rapidly growing family. Enjoy your stay! Don’t worry; you’ve come to the right place. We’ve got you covered, amigo! Now, before we get into the meat of the problem, it’s important you understand how SteamVR and HTC Vive games work. In fact, there are no HTC Vive games per se. By design, and by default, if a developer wants to make an HTC Vive game, he has to go through the SteamVR platform. There’s no other way around it. SteamVR games and applications are based on SteamVR SDK (software development kit), better known as SteamVR Workshop Tools. SteamVR does not discriminate against any current hardware. Any future hardware can be easily supported as well. So, can Oculus Rift with Touch controllers play HTC Vive Games? Of course it can. Oculus Rift with Touch controllers is fully supported by SteamVR. Even if the particular game of choice doesn’t officially support Oculus Rift, you will still be able to play it. The absence of official Oculus support for some SteamVR games means that the developer hasn’t implemented specific control mappings for Oculus Touch, as well as some minor tweaks and optimizations. Therefore, the Oculus Touch controls are most likely wonky, but they will work. Obviously, the ones on the left are for bludgeoning, the ones on the right for knuckle punching your neighbour’s teeth out. Oculus has a separate, exclusive marketplace for Rift VR games and apps, which they call Experiences. Don’t let this confuse you – a lot of games there can also be found on SteamVR, and vice versa. However, a significant portion of Rift Experiences are Rift exclusives. If you’re an HTC Vive owner, or know somebody that is, be careful. These games can only be played on HTC Vive through the use of custom hack known as ReVive. It doesn’t work well with some Oculus games, so Googling around is a must prior to any purchase. You might want to check the community-driven wiki list detailing HTC Vive’s compatibility with most major Oculus games. Obviously, there are differences between Oculus Rift and HTC Vive. If a SteamVR game doesn’t have official Oculus support, it will lack some minor Oculus-specific tweaks and optimizations. The absence of these may cause certain minor performance issues. Real issues, however, arise from the hardware differences. 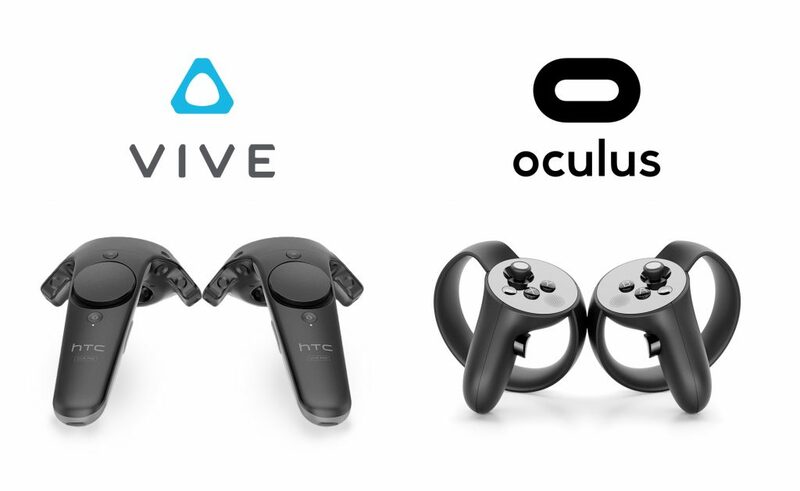 Oculus Touch controllers and Vive wands are probably the most obvious example. The issues are mostly noticeable in games that specifically rely on certain unique controller functionalities, such as a trackpad on the Vive wands or a traditional analogue stick with A, B and X, Y buttons on Oculus Touch. After all, Vive wands are truly ambidextrous, meaning that a single unit will work in either hand. One the other hand (no pun intended), Oculus Touch controllers are designed strictly for a single hand use – one for left hand, one for right. This is why some games that are tailor-made for HTC Vive won’t feel as enjoyable and smooth on Oculus Rift. The same goes the other way – if you are the proud owner of HTC Vive, not all Oculus-exclusive games will have smooth controls with the ReVive hack. The upside to this whole ordeal is that SteamVR is continuously being updated. The default control mappings are regularly modified and improved upon. This closes the gap between the two popular VR headsets. With that in mind, let’s hop back into the virtual domain and play a few rounds together, shall we? Previous articleSore Eyes After VR Experience – What Am I Doing Wrong?